The buried remains of not one, but two castles have been discovered beneath the streets of Glasgow.....you wait for a new castle to come along....and then two suddenly appear at the same time. The two buried structures are thought to represent a 12th or 13th century castle used as secure accommodation by the Bishops of Glasgow, as well as the later Partick Castle. More information can be found at the BBC website. More information at the Evening Times website. More information at the Scottish Water website. 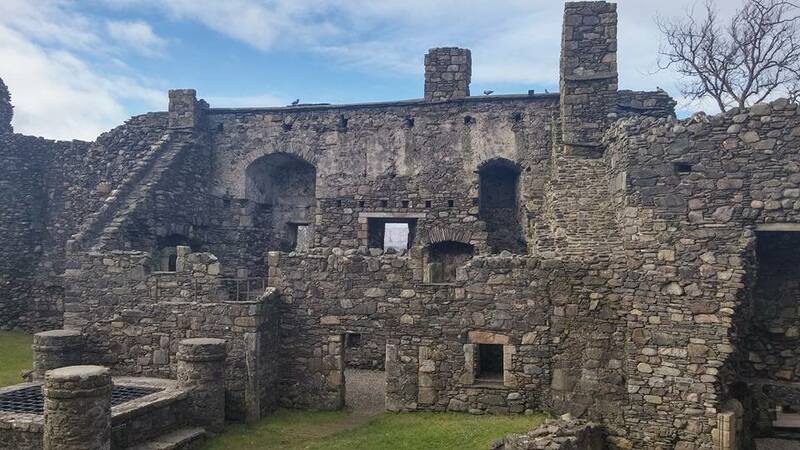 Before Dunstaffnage Castle was built, the headland upon which it sits, may have been occupied by a fort, Dun Monaidh, established as a defencive outpost of the Dal Riatan kingdom of Western Scotland and North Eastern Ulster. This early fort was probably established during the early 7th century and is recorded by John Monipennie, a 17th century historian, as the resting place of the Scottish Stone of Destiny after its removal from Ireland, and before its onward journey to Scone Palace in 843. Modern historians have however, questioned Dunstaffnage's connection with the now famous stone. Above. The castle approaching from the South. 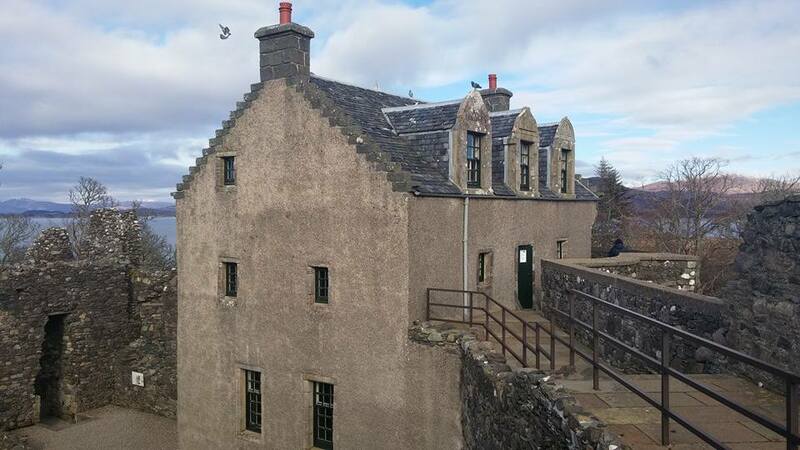 The castle was built by the Lord of Lorn, Duncan MacDougall sometime around 1220, as his principle residence. The castle was attacked in 1230 by Uspak (Ospakr Ogmundsson), self styled sea King of the Isles and military commander representing Hakon Hakonarson (King of Norway) interests in Bute and Kintyre. The attack was unsuccessful, probably indicating that, even after only ten years or so of building, it was a formidable fortress. Duncan MacDougall's son Ewan inherited his father's estates and titles in the 1240s. He took on the title King of the Isles, extending and expanding the MacDougall clan's influence in the region. 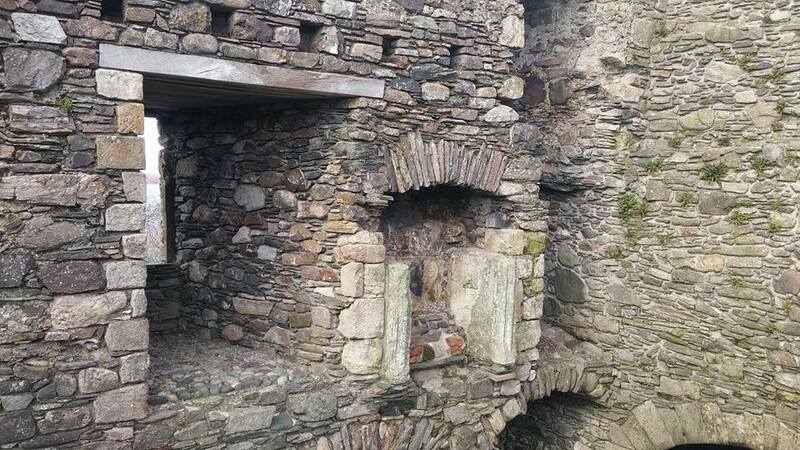 It's thought that Ewan was responsible for the addition of the three round towers into the castle's structure, and also for enlarging the hall. 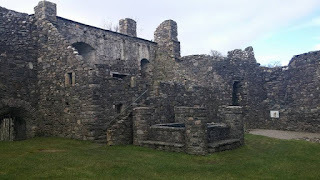 After the Scottish king Alexander III finally rid Argyll of the Norse raiders, the MacDougalls were rewarded for their support of the monarchy, and Ewan's son Alexander was made Sherriff of Argyll in 1293. Their support of the Balliol family's claim to the Scottish throne during the Scottish wars of independence however, brought them into conflict with Robert Bruce, who defeated the MacDougall clan in 1308 at the battle of the Pass of Brander. 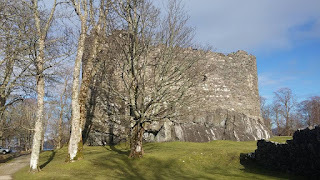 Robert Bruce took control of Dunstaffnage castle after a short siege. Above. The castle's South Eastern walls. 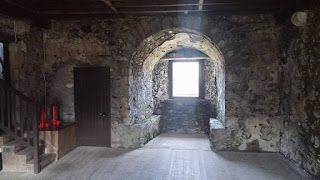 The castle was seized by James I in 1431 following the battle of Inverlochy, one of a number of conflicts between the Crown and rebel Scottish clans. 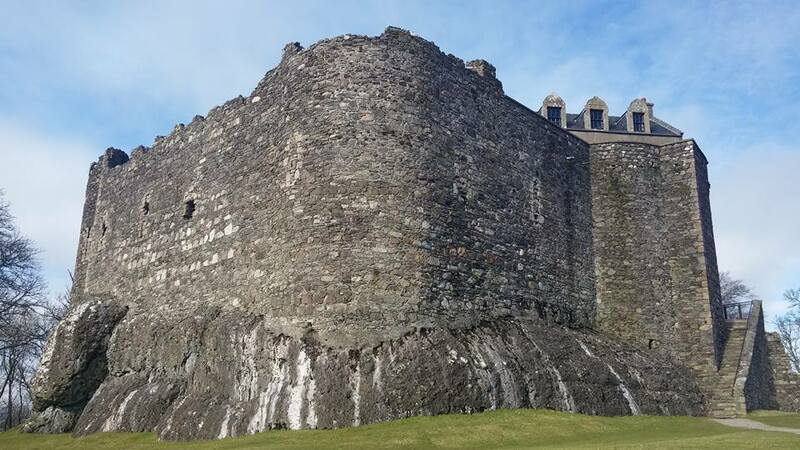 In 1455, Dunstaffnage played host to the 9th Earl of Douglas, James Douglas, on his way to meet with John MacDonald, Lord of the Isles. 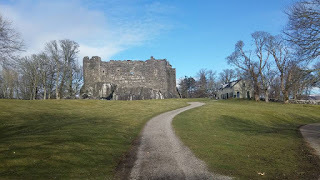 John Stewart of Lorn, keeper of Dunstaffnage castle was stabbed by supporters of his rival, Alan MacDougall on his way to his marriage at the castle. MacDougall managed to wrest the castle from John Stewart's control, but his occupation of the castle was short lived and he was later ejected by James III. 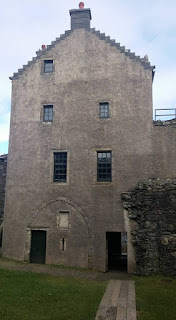 The castle was then granted to Colin Campbell, 1st Earl of Argyll in 1470. Dunstaffnage was a possession passed from family to family, in times of peace and of violence. Above. The castle from the South. 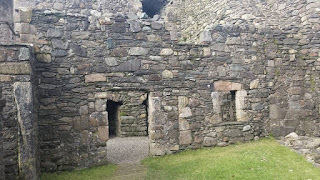 During the English Civil War (The Wars of the Three Kingdoms) Dunstaffnage was besieged by James Graham, 1st Marquess of Montrose's forces (1644) Montrose was fighting for the Royalist cause, but could not force the defending troops. 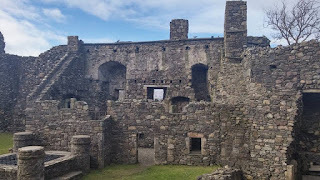 However, in 1685, Royalist forces burned the castle, causing significant damage. During both the 1715 and the 1745 Jacobite rebellions the castle was occupied by Government forces, and it was here, in 1745, that Flora MacDonald, who aided the escape of the Stewart upstart, was imprisoned before her eventual transport to London. Above. The gatehouse from the wall walk. The castle was maintained and added to by the Campbells, who, in 1725, erected a new house over the top of what was the West range of buildings. By this time though, the fabric of the caste was beginning to show its age. To add insult to ageing injury, in 1810, a fire gutted the castle. The damage was so great, that the stewards were forced to leave the castle set up residence in nearby Dunstaffnage House. Above. Interior view of the Southern wall. In 1903, the Duke of Argyll undertook a restoration of the castle. Further work was delayed by World War I, and the full schedule of works was never completed. In 1958, with the agreement of the 21st Captain of Dunstaffnage Castle, and the Duke of Argyll, the castle was gifted into state care. Today, Historic Scotland are guardians. 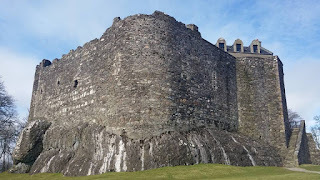 Dunstaffnage is an irregular quadrangle castle, with three round towers at three corners (one very small tower at the South Western angel) The walls are, in some places, up to eighteen metres high and on average, three metres thick. These figures in themselves give some indication as to the quality of defence that the castle would have afforded....however, the fact that the castle is built on top of a rocky outcrop, also means that it would have been all but impossible to undermine the walls or tunnel into the castle. The wall walk originally ran the full circuit of the curtain wall. Historic Scotland have done a lot of restoration on this aspect of the wall, repairing the walk way and making it accessible in places. A number of arrow slits were originally inserted into the walls, and, as weaponry became more advanced, were replaced with gun loops, one of which is shown below. Above. Pistol or gun loop, angled, possibly for protecting a passageway. At, or around the time the walls were erected, three round towers were inserted into the circuit of walls, one at the North, one at the East and another at the West. 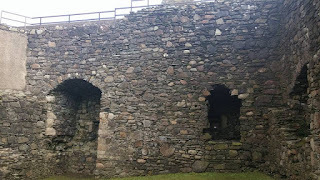 The Northern tower is widely regarded as the keep here at Dunstaffnage. It stands to three storeys now, but was probably originally four storeys tall. As this was most likely the keep, it would have contained either the Lord's apartments or accommodation for high status visitors. The Western tower hardly projects beyond the exterior of the wall, and is largely built within the walls. 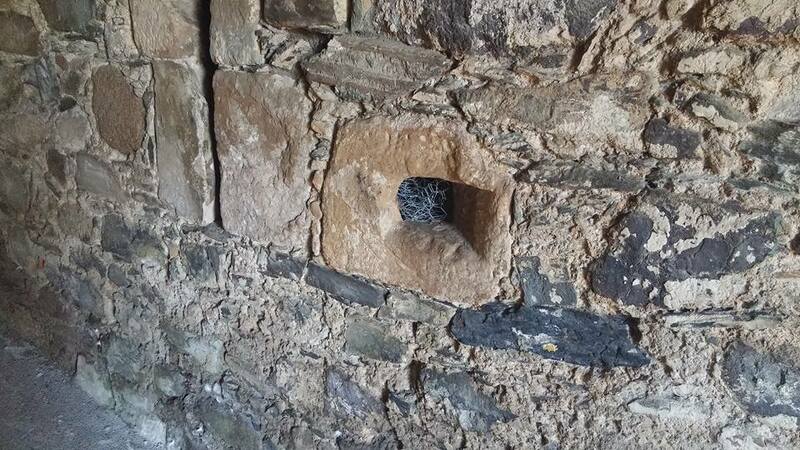 It was entered solely through an entrance from the wall walk. This tower contains a basement that was most likely some sort of holding cell or prison with access from above. Above. View of the North West range and the well. The gatehouse, which was built during the 15th century by the Campbells during their tenancy of the castle, replaced the original gatehouse in the Eastern tower. It is basically a four storey tower house, very similar in structure to the many tower houses found throughout Scotland. The entrance runs through half of the vaulted basement, with a number of rooms occupying the other half. A number of arrow slits\gun loops face out towards the gate. 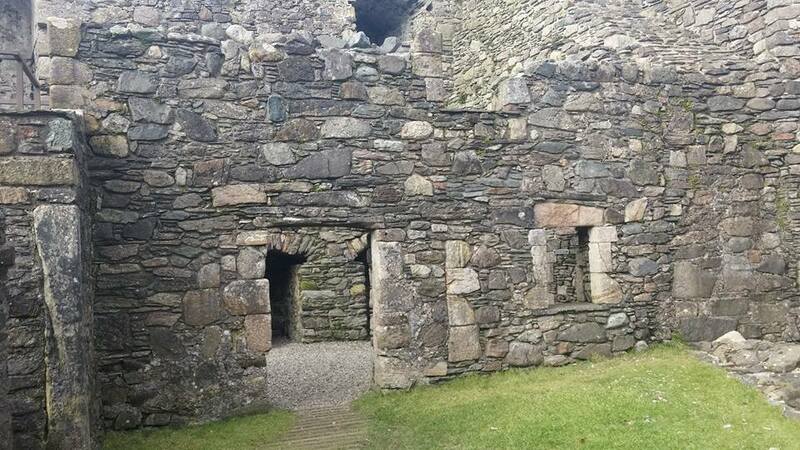 The stone stair that now provides access to the gatehouse, replaced an earlier drawbridge. 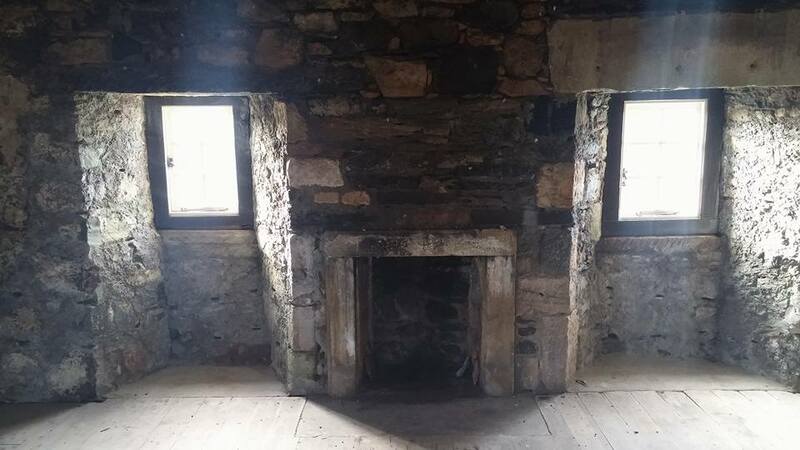 During the 18th century, the tower house\gatehouse was altered to provide private accommodation for visiting Campbells. The range of buildings along the North and East walls, are now only represented by footings and foundations. There would have been a hall built above vaulted cellars, kitchen and other domestic buildings. The castle is run by Historic Scotland. Visiting information can be found here - Dunstaffnage visiting information.